Adding to our growing line of survival kits in sturdy stackable plastic pails, we are proud to offer you our new ESSENTIALS bucket kits. These kits are available for two, three, four and five people and are ideal for home, office, car, rv, boat, also for schools and organizations. The plastic pails we use (unlike many others) come with a lid that is removable, allowing you access to the kit contents at any time without having to tear off a strip or break a seal. This makes them ideal for kit content inspection and quick access to the survival supplies when you need them. 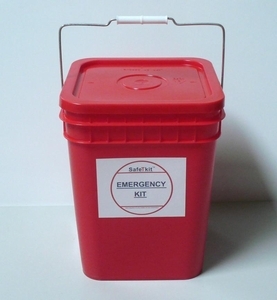 What comes inside our 4 Person Emergency Bucket Kit? This disaster tool kit has been designed for use at home, office, factory or warehouse, organizations or wherever groups of people gather. The kit contains high quality disaster tools, safety items for personal protection, lighting and first aid products along with sanitary supplies to care for people after an emergency event.